TheraHoney sterile wound dressings contain 100% pure, medical-grade Manuka honey made by bees foraging on the Manuka flowers of northern New Zealand. Manuka honey has unique properties that help create a moist wound environment conducive to wound healing, promote natural (autolytic) debridement to clear away necrotic tissue, and reduce wound odor. 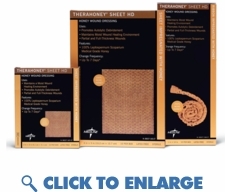 TheraHoney HD features 200% more Manuka honey than TheraHoney Sheet. TheraHoney HD is an easy to apply dressing impregnated with 100% sterile, medical-grade Manuka honey. HD's strength allows it to be easily cut, easily placed, and easily removed from the wound in one piece (even in tunneling wounds). The honeycomb is used only one time, and once harvested, the honey is carefully filtered, irradiated and tested in a laboratory. High sugar levels (87%) in the dressing result in osmotic pressure that helps promote autolytic debridement of necrotic tissue, helps promote a moist wound healing environment, and helps rapidly reduce wound odor. TheraHoney HD is porous, permitting the passage of exudate into a secondary dressing. Indicated for use on wounds with any drainage level. Natural. 100% medical-grade Manuka honey. High sugar levels result in osmotic activity that helps promote autolytic debridement to clear away necrotic tissue. pH Balanced. Low pH for an ideal moist wound healing environment. A naturally sweet smell that removes odor-producing bacteria via the transfer of exudate to a secondary dressing (autolytic debridement). Carefully filtered, irradiated and tested in a laboratory.